RRP: $3349 body only, $4949 with 24-105mm lens. Boasting a Dual Pixel CMOS sensor with an effective resolution of 30.3 megapixels, coupled with a DIGIC 8 processor, the EOS R is an attractive camera that will challenge its (slightly) lower-resolution competitors, the Nikon Z6 and Sony α7 III. Smaller and lighter than the EOS 5D IV, it enables users to record movie clips while using the viewfinder for shot composition. The EVF is competitive, with high resolution (3,690,000-dot) and a comfortable 23mm eyepoint, plus excellent colour and detail reproduction. Sadly, it doesn’t offer blackout-free continuous shooting and the camera lacks the in-body image stabilisation (IBIS) of its main competitors, so it’s not as easy for users to capitalise on its excellent low-light performance. 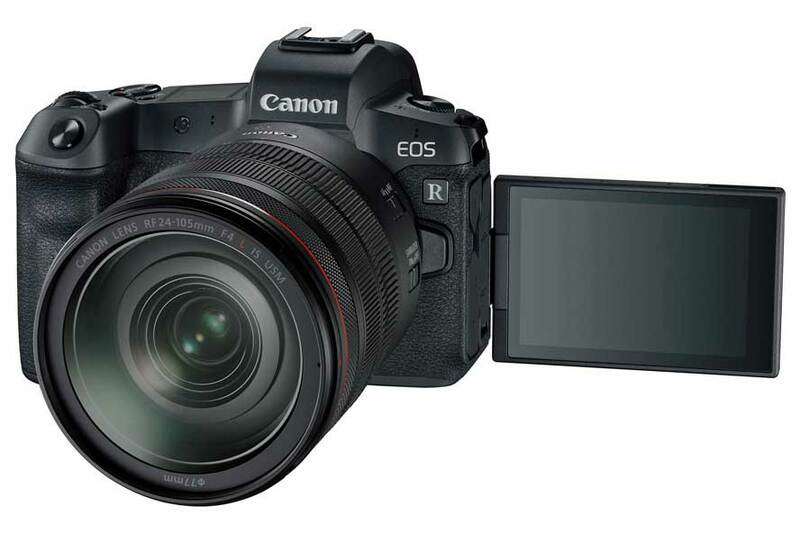 On the plus side, new controls like the programmable touch bar and the Control Ring on the new RF lenses allow the buttons and dials to be optimised to make the EOS R straightforward to use. The introduction of a USB Type-C port supports in-camera battery charging, including when the camera is tethered, making it suitable for studio use. Location photographers will be impressed by the shutter design, with the shutter located in front of the sensor. It closes when power is switched off, preventing dust from entering the camera when swapping lenses. The EOS R’s menu is essentially the same as Canon’s DSLR cameras so transition to mirrorless should be seamless for existing Canon users. The 5655 manually selectable AF points cover 88 percent of the frame width and the entire height of the frame. AF sensitivity is such that the EOS R can focus in the dark. 1. Smaller and lighter than the similarly-specified EOS 5D IV, the EOS R is more comfortable to hold and easier to use when shooting stills and video clips. 2. The sophisticated 5655-point AF system provides plenty of optimised settings and performs well in low-light situations. 3. The USB Type-C port supports in-camera charging and allows the camera to be charged while in use in tethered studio situations. 5. Three lens adapters are available to allow legacy ‘full-frame’ EF lenses to be used on the EOS R body. There should be no deterioration in lens performance when these lenses are used. 6. The Digital Lens Optimizer applies real-time, in-camera corrections for common optical aberrations and distortions to prevent loss of resolution and overcome chromatic aberrations.